Orange Grove Center is an active participant in both Unified and Traditional Special Olympic events. 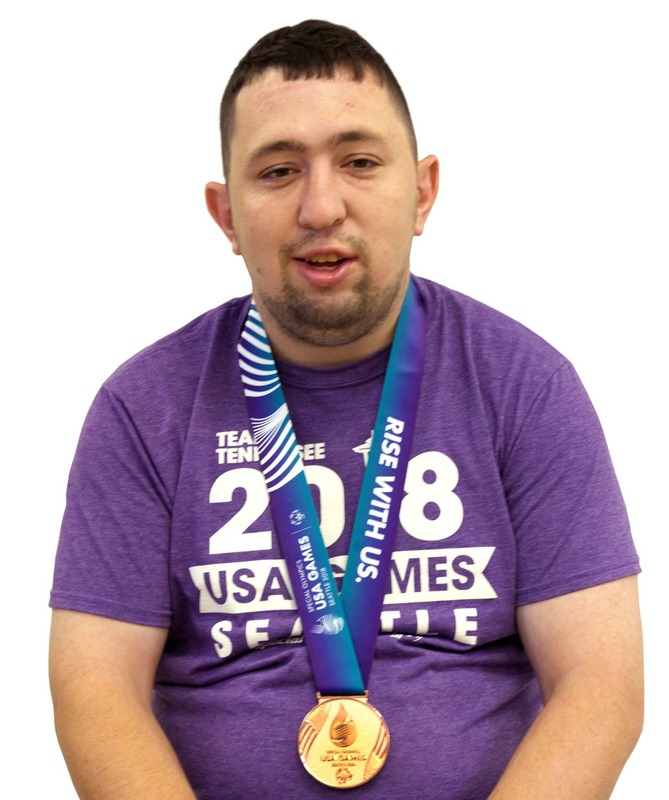 Athletes compete at local, state, and national levels in Special Olympics bowling, track and field, flag football, basketball, bocce ball, swimming, and volleyball competitions. Through competition, our athletes have the opportunity to develop physical fitness, demonstrate courage, experience joy, and participate in a sharing of gifts, skills and friendship with their families, other Special Olympics athletes, and the community. Click here to see upcoming Special Olympics events. Volunteers are the lifeline of the Special Olympics program. Volunteers serve as coaches, partners, and officials. If you would like to become a part of the Special Olympics, contact Hal Baker at [email protected] or (423) 309-6641. Let me win, but if I cannot win, let me be brave in the attempt." We are very proud of the hard work and determination our 150 athletes and coaches put forth in practices and tournaments. The joy that is visibly seen through the smile on every athletes face the moment the games are declared open, speaks volumes to the life-long lessons, memories, and friendships formed through the Special Olympics. We would like to recognize three athletes who had significant moments this year. Mary Crews, one of our multi-sport players, was named the Special Olympic Athlete of the Year at the Summer Games. Mary was quite honored to receive this recognition and we are all very proud of her. James Long retired from playing competitive basketball with a tearful farewell at the Spring Sport Luncheon that was seen by visitors from the National office of Special Olympics and memorialized in an editorial in Exceptional Parent Magazine. Keith Kirby was invited to play on the Unified Marion County basketball team that received an invitation to compete in the National Games in Seattle. He traveled with the team and his family accompanied him. This was a great recognition and he has some great stories to tell everyone and is an example of the opportunities possible through Special Olympics.